Notice something strange about the wall mural in the above photograph? It’s upside down! 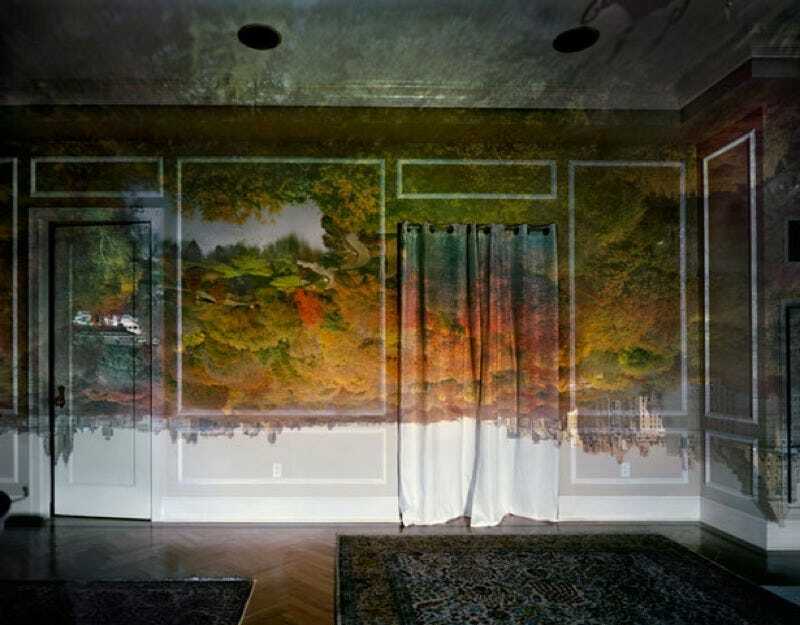 That’s because it was created using a “camera obscura” — the favored technique of Cuban born artist Abelardo Morell, who has been experimenting with this approach since 1991. Latin for “dark room,” conceptually, a camera obscura is the precursor to the pinhole camera, but the effect dates back at least to Aristotle. (The earliest mention is found in the writings of Chinese philosopher Mo-Ti, circa 5th century BC, who called it a “collecting place” or “locked treasure room.”) All you need to create your own camera obscura is a small hole in a shade or a wall, so that light can pass from a sunlit garden, for instance, into a darkened room, projecting an inverted image on the wall opposite the pinhole. That inversion is due to a quirk of basic optics. Light scatters off each point of an object and travels outward in all directions. The pinhole acts as a lens, letting in a narrow beam from each point in a scene. Those beams pass through the hole in a straight line and then intersect. The result is that the light from the bottom of the scene outside hits the top of the opposite wall, and vice versa. Hence the inverted image. Morell’s interest in this ancient technique began in 1988, when he was teaching photography in Boston. On a whim one sunny day, he covered all the windows in the classroom with black plastic so that it was pitch dark inside, punched a small hole in the plastic, and then savored his students’ enthralled reaction as upside-down moving images of the street scene outside appeared on the back wall. “When I saw how these savvie, techie students were charmed and disarmed by the image on the wall, I knew this was something very potent,” Morell told National Geographic back in 2011. Since then, he’s used variations on the basic camera obscure technique to create a rich collection of eye-popping images, initially in black and white, but more recently in full color. Early on, it would take eight hours or more to capture those ghostly images in a photograph, but the advent of digital photography reduced that time to minutes. He’s even devised a portable version: a tent that he can set up on a rooftop, for instance, projecting images right onto the ground. Nor is Morell the first artist to find inspiration in the camera obscura. Even before the invention of photography, an artist could tape a piece of sketch paper to the opposite wall and trace the outlines of whatever image was being projected from outside. A 17th century scientist named Giovanni Battista della Porta first suggested this might be a useful artistic aid, and Philip Steadman — a professor of architecture and town planning at University College London — has offered compelling evidence that the 17th century Dutch painter Johannes Vermeer used a camera obscura to get the correct perspective in his paintings. To test his hypothesis Steadman went so far as to build a one-sixth scale model of the actual room in which Vermeer created at least ten of his timeless paintings, studying the interplay of light and shadow. More recently, New York City artist Vera Lutter used a camera obscura to capture the famous neon red Pepsi Cola sign along the East River in Long Island City from a small darkened shack on a rooftop opposite the sign. She draped sheets of photosensitive paper to the shack’s wall and waited for the image to burn into it, then turned those sheets into prints in her Manhattan studio. The technique is a cornerstone of her art. “When I first saw an image projected like this, I just thought I was seeing god,” she told The New Yorker in 2004. No doubt Morell felt the same way. National Geographic has a lovely photo gallery showcasing some of Morell’s best work over the years. You can also check out highlights in this video (embedding disabled), and watch an interview with the artist below. Steadman, Philip. Vermeer’s Camera: Uncovering the Truth Behind the Masterpieces. Oxford University Press, 2001.